Deena White, designer for Umee, has created a line that is both elegantly chic and flirty fun! When I look at her clothing, it's the detailing that's important - with the embellishments of a few ruffles, pleats or bows. I actually saw her clothes at a trunk show at the Contemporary Museum a few weeks ago and they are stunning. Her clothes are quality and her prices are reasonable. Best of all, it's made here in Hawaii. I guess why I'm so drawn to her clothing is because she puts a fun twist on business casual attire! I hate to buy work clothes! Some of my friends know this... I'll drop $$$ on a cute cocktail dress, top, shoe... But when it comes to what I wear five consecutive days a week I pinch my pennies. Strange, I know... I guess I feel it's because simple skirts and suits are all too generic. I can't wait to be my own boss and wear whatever I want. 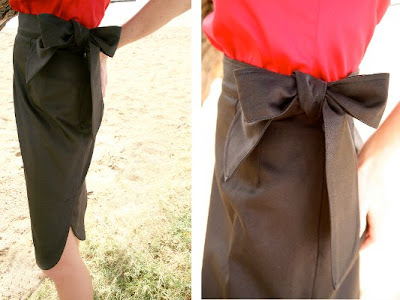 However, Umee's ruffle wrap skirt (pictured above in green) is far from generic. It comes in various colors so it's appropriate for the office yet beachy chic and can easily transition from work to happy hour play time! For any future brides-to-be, Deena is coming out with a wedding line this coming summer, July 2009! Look out for smaller sizes (size 0s) coming soon to her website! Right now Umee is only available online - check it out!